Until now. 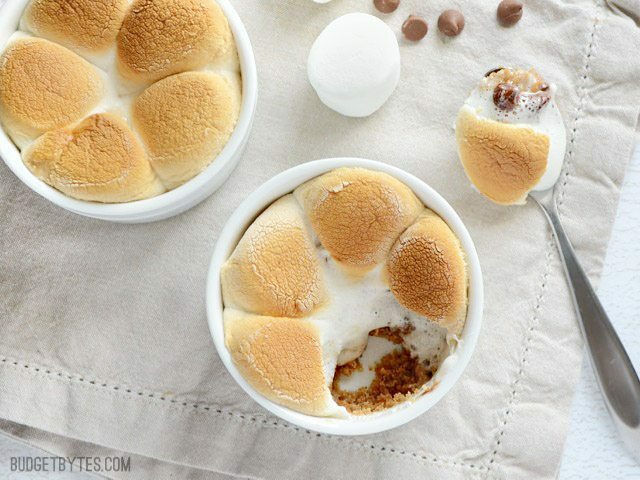 Say hello to the S’mores Pot. A crumbly graham cracker crust, a melty middle layer of peanut butter and chocolate chips, and a gooey, golden brown marshmallow top. Holy wow. Yes. I intended this to be another “dessert for two” recipe, but as I was eating my S’mores Pot it was just so deliciously rich that I think one little pot might be enough for two. So, the recipe below makes two pots, which could theoretically feed up to four. If you want to make just one pot, the recipe can easily be cut in half. It’s very flexible too, so if you want more or less of one layer you can certainly customize it to your liking. Anyway, back to the s’mores! 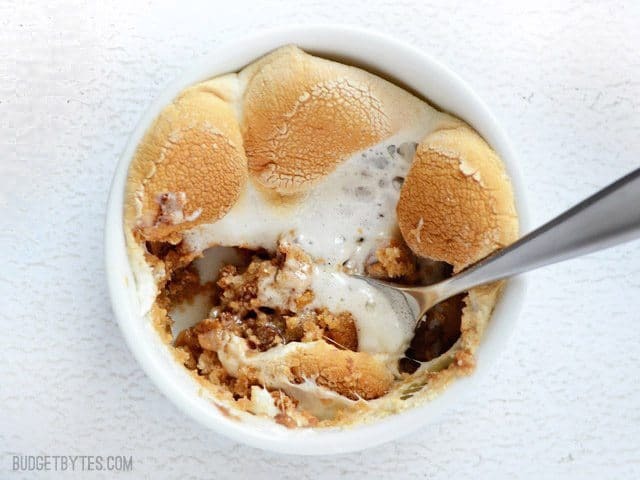 Get your favorite gooey s'mores flavors in a layered, oven baked S'mores Pot. Graham cracker crust, peanut butter, chocolate chips, and toasted marshmallows. Preheat the oven to 350 degrees. Place three whole graham crackers (rectangles, not the square half) and place them in a zip top bag. 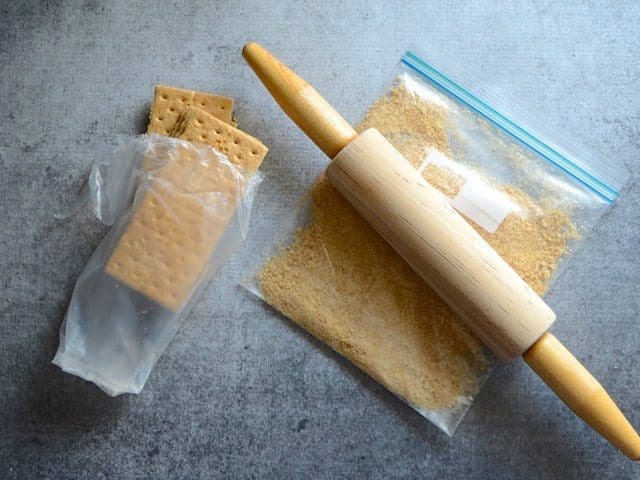 Use a rolling pin to crush the graham crackers into crumbs. Melt the butter in a medium bowl. 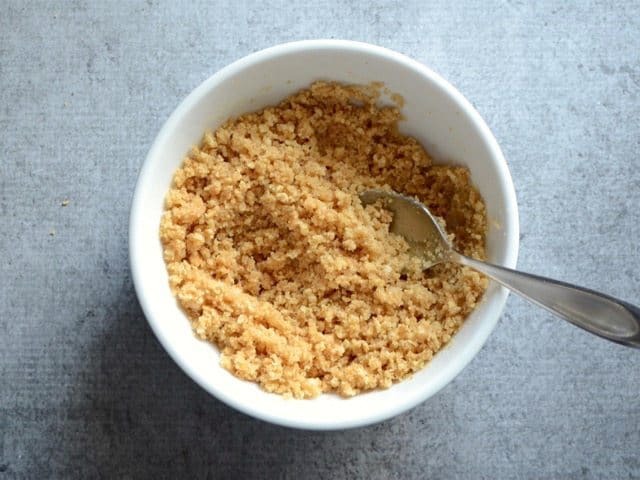 Once melted, stir in the sugar and graham cracker crumbs. Stir the mixture until it looks like damp, coarse sand. Divide the mixture between two 8oz. 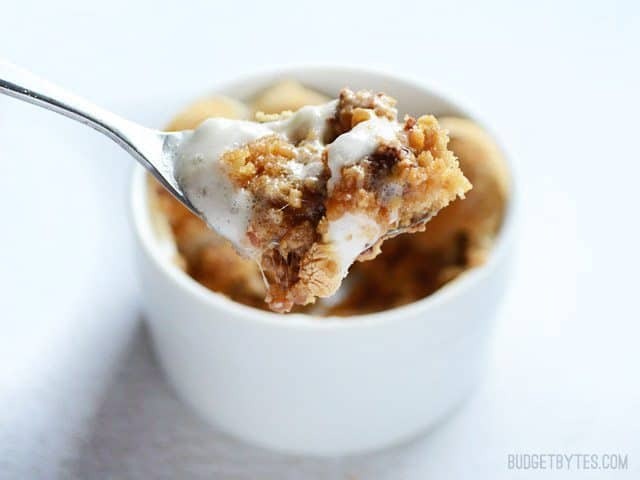 ramekins and use the back of a spoon to pack the mixture into a solid layer. Drop about 1 Tbsp of peanut butter onto each graham cracker crust, followed by a sprinkle of chocolate chips (1 to 1.5 Tbsp for each ramekin). 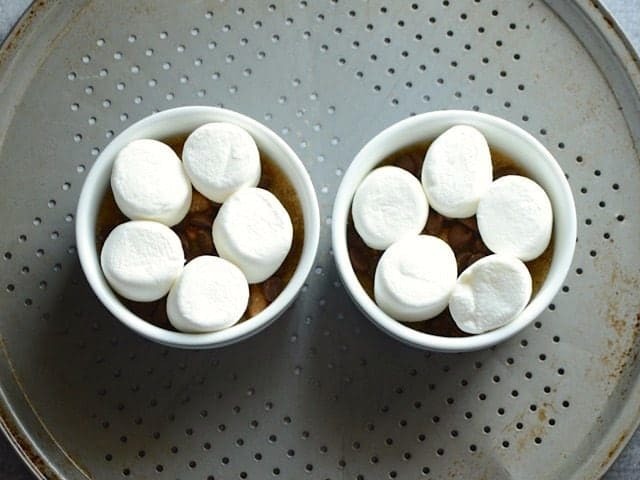 Arrange the marshmallows in a single layer in the ramekin. Use enough marshmallows so that they are touching each other, but not packed in tight. They will spread as they melt. 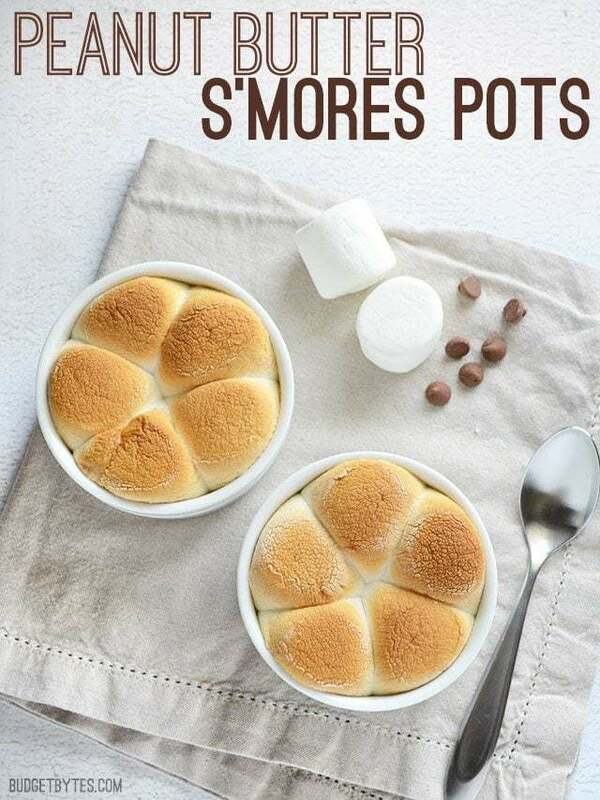 Bake the s'mores pots for 15 minutes, or until the marshmallows are puffy and light golden brown. Serve hot (use a pot holder or wrap the ramekin in a towel because it will be hot!). Preheat the oven to 350 degrees. Start the graham cracker crust by crushing three whole graham cracker rectangles. A zip top bag helps make this job a little less messy. Crush them until they are fine crumbs. 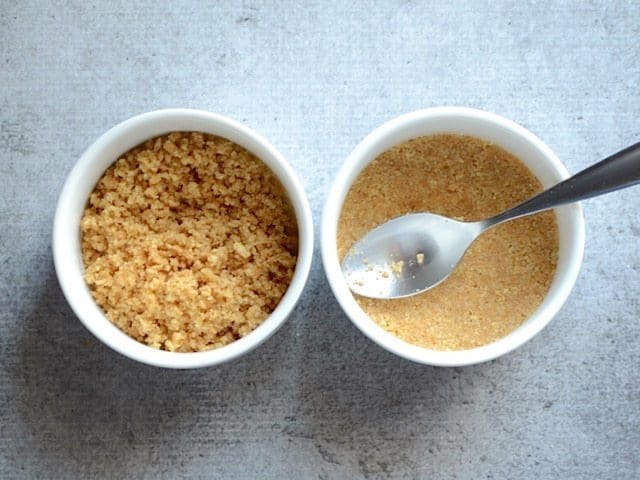 In a medium bow, melt 2 Tbsp of butter, then stir in 1 Tbsp sugar and the graham cracker crumbs. Stir until the mixture resembles wet, coarse sand. Divide the graham cracker crust mixture between two 8oz. ramekins. Use the back of a spoon to press the crust into a solid layer. 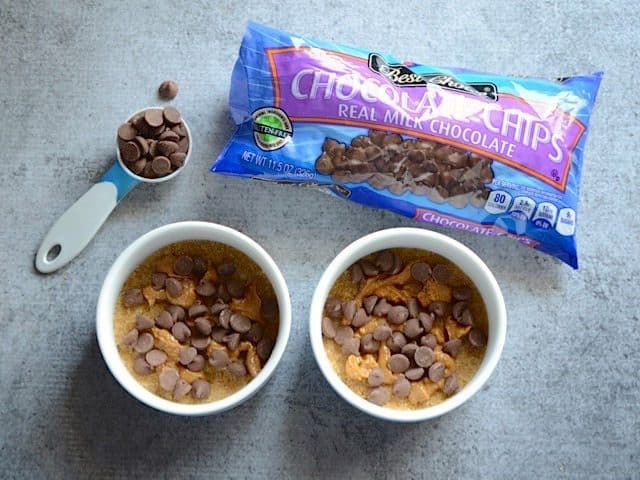 Add about 1 Tbsp peanut butter to each ramekin and a sprinkle of milk chocolate chips (1 to 1.5 Tbsp chips). I didn’t think spreading the peanut butter would be very successful, so I just added it in little drops. 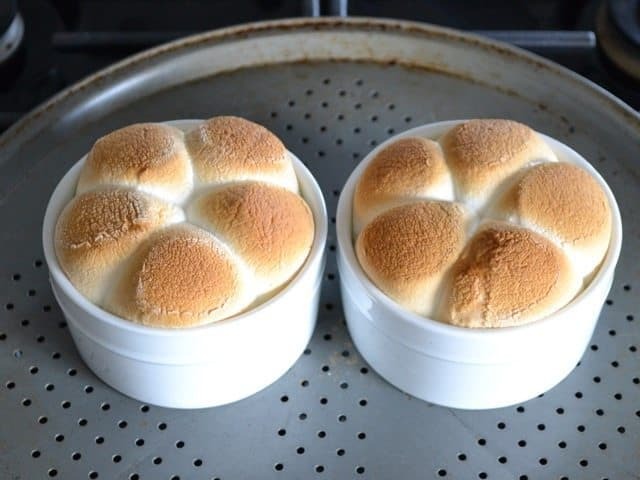 Finally, add a layer of large marshmallows to the top of each ramekin. Use enough marshmallows so they are touching, but not totally packed in there. They will spread as they melt. I used five for each ramekin. Also, I like to put my ramekins on a baking sheet (or pizza pan in this case) to make them easier to move in and out of the oven. Bake the pots for 15 minutes, or until the marshmallows are puffed up and light golden brown. If you want extra browning, you can pop them under the broiler for a QUICK minute, but watch them carefully. Serve the s’mores pots immediately so everything is still all melty and gooey. The marshmallows will deflate as they cool down. Be careful, though, the ramekins are hot so either use a pot holder or wrap them in a kitchen towel when you handle them. Oh. My. 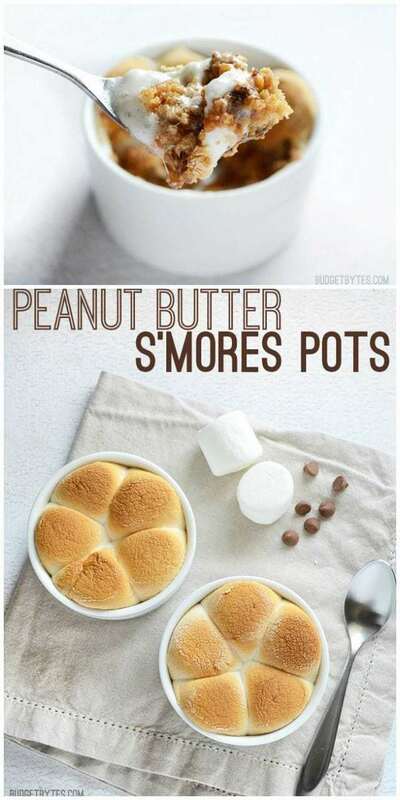 S’mores Pots Heaven. So, are you going to make these S’mores Pots? Hi, can I make these in a muffin tray instead? It may change the cooking time a bit as the muffin tins aren’t as thick and insulated as a ceramic ramekin, but other than that it should work. I buy pre crushed graham crackers for other baking…..how many tablespoons would 3 rectangles equal? Can’t wait to make these! Can you tell me roughly how many cups of graham cracker crumbs you used? I don’t have any graham crackers just crumbs so I’m trying to figure out the ratios. Thanks! Oh shoot, I didn’t think to measure them once they were crushed and this recipe was so long ago that I haven’t a clue. I’m so sorry! Where did you find your ramekins?! Just found your website and this is the first recipe I have tried. A home run! Three more of your recipes on the menu for next week and I’m ordering your cookbook right now. Simple, delicious food with ingredients I always have on hand. What a concept, love it! Using the microwave to melt the peanut butter makes the whole process easier and allows the mixture to settle more evenly. I can confirm that this is dangerously delicious and easy to make! I’m tempted to try this with Nutella instead of peanut butter. Can you use regular coffee mugs instead of Ramekins? If they specifically say they are oven safe, then that would probably work. I don’t know if most mugs are oven safe, though.